Home » What is Sleep? The pace and priorities of modern society have led many of us to believe that rest and downtime are optional. Work, family, and school schedules may seem to require more hours than exist in a day, often leading us to steal time from one of our most essential biological functions: sleep. Sleep is an altered physiological state that recurs on a daily basis. Sleep is characterized by a unique state of consciousness, decreased sensory awareness, and lower reactivity to stimuli. (1) It is universal among living organisms, across all species, from insects to elephants. Sleep is a drive, as important to health and well-being as food and water. Less than two weeks without sleep is typically fatal to humans and most animals. Contrary to historical belief, sleep is an active state involving complex physiological changes and crucial bodily processes that allow us to learn, store memories, fight infection, and metabolize food. For many organisms including human beings, sleep is characterized by lying down and shutting the eyes. Unlike other states of altered consciousness such as coma or hibernation, sleep can be reversed easily. In addition to visual signs, sleep in humans and many other animals is recognizable by distinct patterns of brain waves on electroencephalogram (EEG). One of the defining features of sleep is lowered arousal of the brain. Neurons fire randomly at a high speed during wakefulness but are slower during sleep, with a more coordinated pattern. Neurons fire more rapidly during REM sleep, the stage of sleep that closely resembles being awake. This may be due in part to the vivid dream activity that occurs during REM sleep. Q: Which mammals sleep the least, and which sleep the most? 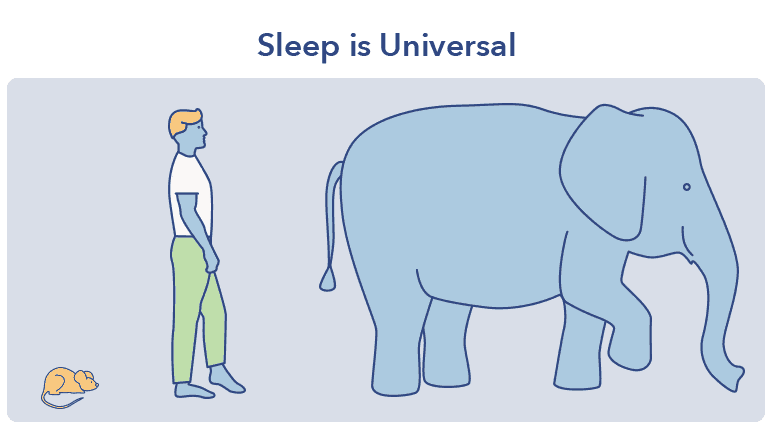 A: Elephants sleep only four hours each day, while armadillos and cats sleep as many as twenty hours. The organized and structured process of normal sleep is known as sleep architecture. 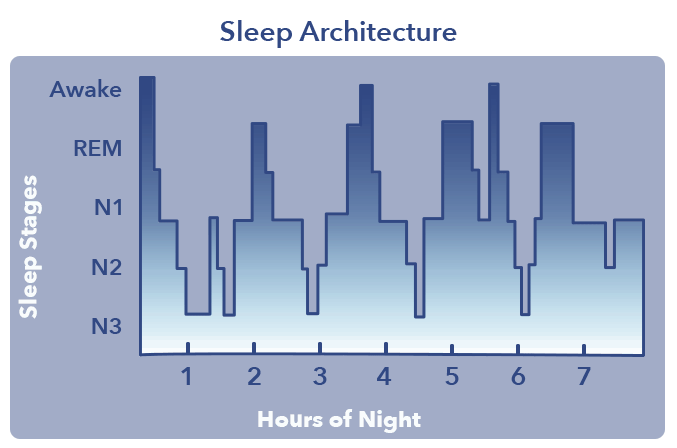 (4) Typical sleep architecture consists of four cycles, each lasting an average of 90 minutes. A 90-minute cycle consists of three stages of non-rapid eye movement sleep, known as NREM sleep, and one of rapid eye movement sleep, known as REM. The full process of all four cycles takes approximately seven to eight hours to complete. Every stage of sleep is designed to occur in order for a prescribed amount of time. Sleep appears to trigger a wide range of bodily processes that occur only while other functions such as visual processing and digestion are minimally active. Lower body and room temperatures help to bring on sleep, and may be associated with early human history when we slept outdoors or in caves. (7) Reduced body temperature also helps preserve energy, which may be one of the primary functions of sleep. Dreams are common during sleep, and are most frequent and vivid during REM sleep. Once considered to be meaningless responses to brain activity during sleep, dreams may be instrumental in emotion processing, a theory supported by brain chemistry during REM sleep. The stress hormone norepinephrine is absent from the brain during this stage of sleep, allowing emotions to be reenacted and committed to memory in a low-stress environment. Cell-signaling molecules. 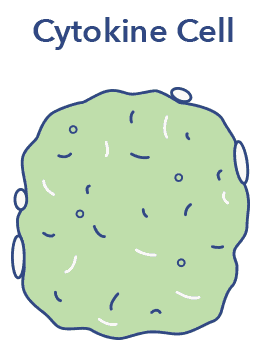 The origin of the word is Greek, meaning cell (cyto) and movement (kinos). Sleep typically occurs during the night. 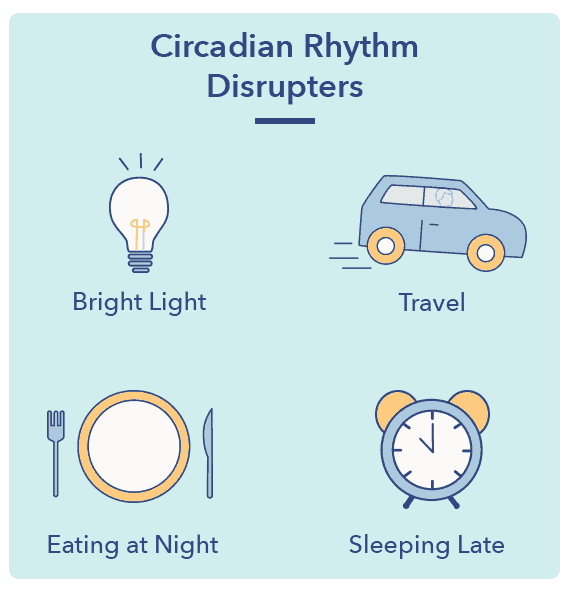 The circadian rhythm is the 24-hour biological clock that helps to regulate sleep, using cues from sunlight and darkness to signal sleepiness or wakefulness. The circadian rhythm depends on three primary factors to regulate sleep and waking: light, time, and the release of melatonin. The circadian rhythm’s master clock is located in the suprachiasmatic nucleus, or SCN, in the hypothalamus of the brain. The SCN functions as the brain’s pacemaker, and controls sleep and waking, neuroendocrine function, the autonomic nervous system, and many other critical bodily processes. (9) The circadian system is not limited to the SCN, and can be found throughout the body in smaller, “local” clocks located in organs and muscle tissue. Neurotransmitters such as adenosine are also involved in sleep and wakefulness. Adenosine gradually builds up during the day in parts of the brain associated with sleep and waking. Higher concentrations of adenosine inhibit alertness and cause sleepiness. Sensory gating is a neurological process that involves the filtering of stimuli so that only meaningful information reaches the brain. (10) It is an essential part of sleep that occurs in all four stages. Sensory gating allows the brain to protect the sleep state by ignoring non-threatening sounds, visual signals, and physical contact. Sensory gating originates in the pulvinar nuclei, a cluster of neurons located in the thalamus of the brain. Though other regions of the brain are involved, as well, the pulvinar nuclei are the gatekeepers of stimuli, choosing which noises, sounds, and touches require awakening and which may be ignored. The part of the brain responsible for relaying of sensory signals as well as the regulation of sleep, waking, and consciousness. Nearly all sleep disorders have significant effects on quality of life, cognitive and physical functioning, and psychological well-being. The impact of sleep disorders, whether they entail too much sleep, too little sleep, or disrupted sleep, underscore the importance of healthy rest to the smooth functioning of every bodily system. Q: What do fruit flies have to do with human sleep? A: Fruit flies have remarkably similar circadian rhythms to human beings. Caffeine keeps them awake, and they react to sleep deprivation with longer periods of deep sleep much as people do. Sleep needs evolve throughout life as the brain and body develop and grow older. The National Sleep Foundation recently created sleep range recommendations based on age. Though the sleep needs of most people will be satisfied by these recommendations, some outliers fall outside the current guidelines. 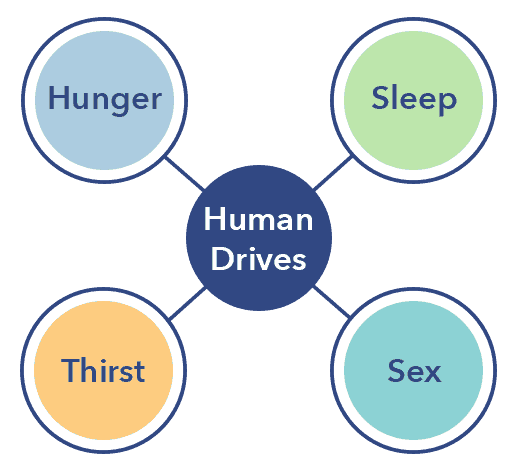 Some people require only four to five hours each night for healthy functioning, while others require several hours more. While needing less sleep is rarely a sign of a sleep disorder or other condition, the need to sleep much more than nine hours as an adult can be a sign of hypersomnia or narcolepsy, particularly if accompanied by symptoms such as daytime sleepiness or sudden weakness. Sleep is an essential physiological process, as critical to life as oxygen and water. It is so important that the nightly need for sleep supplants the drive to mate, eat, or defend oneself. Sleep is much more than the need to “shut down” the body and brain — it is a crucial part of physical and cognitive well-being. The rest we get at night makes healthy daytime functioning possible. Though we have little conscious awareness of the processes that occur during sleep, we experience their effects in our ability to learn, pay attention, and function at our best.